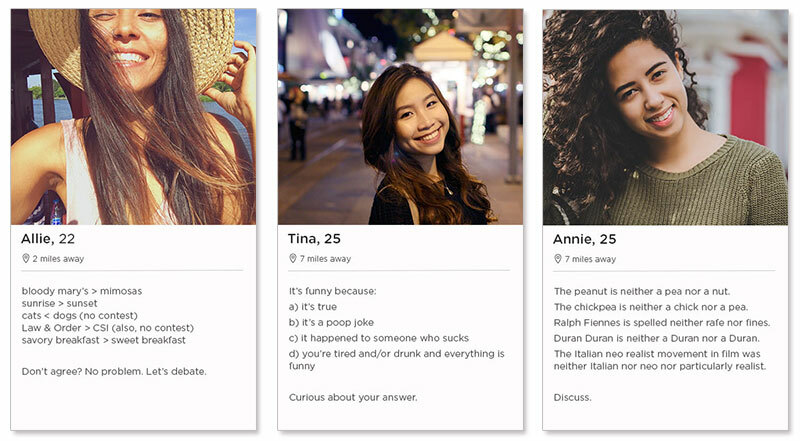 Ah, the ever elusive dating profile description… Chances are if you’re reading this, you’re looking at that tiny About Me box on your Tinder profile, watching that little red cursor blink, and wondering what in the world you should say about yourself in 500 characters or less. Trying to describe yourself can be daunting, but there are some things you can do to make it easier on yourself. 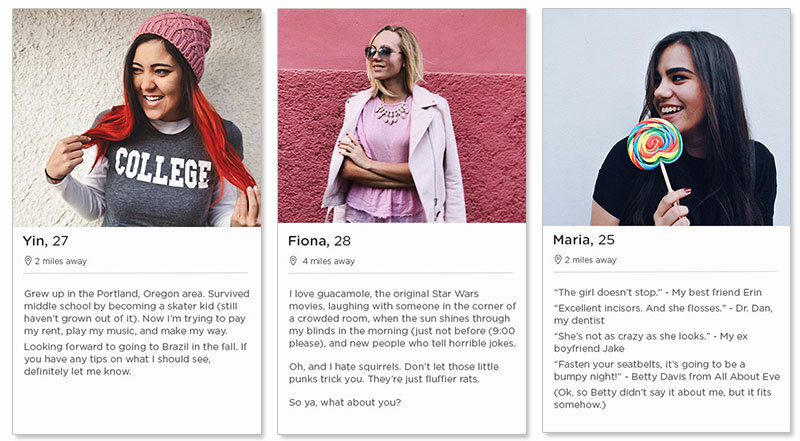 Below are some short and sweet Tinder profile examples for women to give you some ideas of what to say, along with a few little tricks (you might even call them hacks or cheats) to help you come up with your own amazing Tinder bio in a relatively short amount of time. Don’t agree? No problem. Let’s debate. The peanut is neither a pea nor a nut. The chickpea is neither a chick nor a pea. Ralph Fiennes is spelled neither rafe nor fines. Duran Duran is neither a Duran nor a Duran. The Italian neo realist movement in film was neither Italian nor neo nor particularly realist. Tip: Give them something to talk about. It’s no secret that starting a conversation on a dating app can be hard, so if you want to make it easier for someone to start a conversation with you, give them some easy ways to start chatting. Put a question in your profile, something you’d like them to ask you, a topic that’s up for debate, or an icebreaker. It seems odd to say this, but it doesn’t even need to be about you. If you pick a topic, say something silly, or ask a question you’re showing your personality, not telling someone about it. It many ways, it’s much more powerful. An easy way to create a profile that gets people talking, is to use the greater than/less than trick. Simply list out sets of things you could debate or have an opinion about with someone, and say which you think is best. And the more absurd or seemingly trivial, the better. Your profile should show the weird, wonderful things about you and instead of saying what your job is, or that you like to travel, get random. Want some other ideas: tacos < burritos, Friday nights out > Thursday nights out, National league > American league, Radiolab > Serial, and the list goes on and on. Kiss: Jacob Allen in my friend Krissy’s basement. So many braces… so so bad. Job: Polishing little figurines at The Hallmark Store. Guy I swiped right on: We’ll have to see now, won’t we? Met a New Pornographers fan I didn’t like. Tip: Lists are your friend. If you want to make your description short, scannable, and easy to read put together a list. It makes your description look more approachable than a large block of text and catches the eye easier. Start with a small headline, then elaborate. And don’t forget to include those small details that spark conversation. 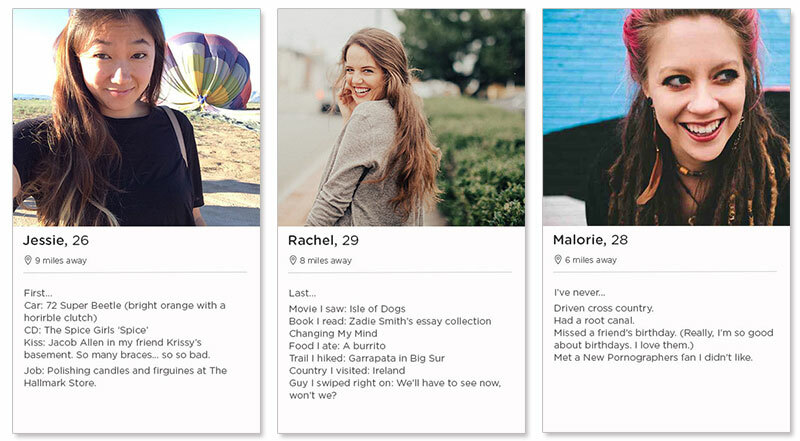 Another quick way to create a no fuss but plenty of fun profile—list off some firsts or lasts. Listing of things like the last concert you went to, person you called on the phone, place you visited, or even what you had for lunch, gives people a sneak peak into what your everyday life and interests are like. Or want to get nostalgic instead? List off some firsts like first crush, first pet, first place you lived, or first book you loved. Hey, you can even mix them up and list your firsts and lasts together. About Me: I like to sing-talk, guys with messy hair, reading the New Yorker on Sunday mornings, and funny voices. About You: If you’re still reading, that’s pretty good. Let’s do this. All happy girls are alike; every unhappy girl is unhappy in her own way. My kind of unhappy is full of self-deprecating humor, double IPAs, and is actually pretty rad. Let me know if you want to be miserable together. I live my whole life setting up situations that will eventually lead to the phrase, “And then laughter and hilarity ensued…” Hoping this one will work out too. Tip: Let your freak flag fly. 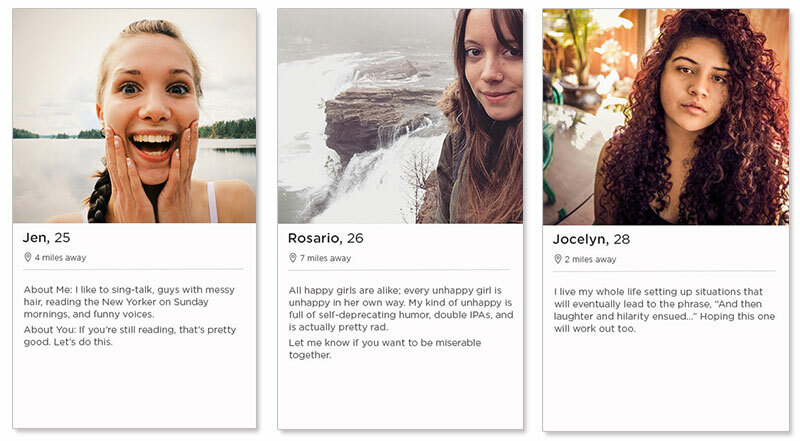 There are so many people and profiles on Tinder, that it can get boring reading the same ol’ same ol’ about hiking, traveling, working, spending time with family and friends… These aren’t bad things (I love these things, we all do) but they’re universal things and they don’t help someone really get to know what’s unique about you. Don’t be afraid to get a little weird. Share a secret desire, an odd personality trait or habit, or be a little dark… or overly optimistic. Whatever you do, be different. 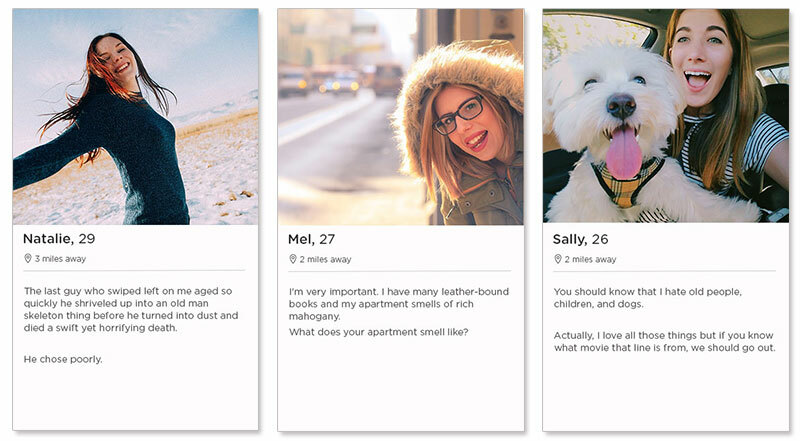 Here’s an easy template for a Tinder profile—organize your thoughts into short About Me/About You sections. Just list a few interesting details about you (and, like I said, the weirder and more random the better) then a few things about the type of person you’re into. About Me: I love stinky cheese, the smell of dog paws, and going camping by myself for my birthday every year. About You: You have a dog, know how to give as good as you get, and don’t mind crashing my (lack of a) birthday party. Try it! The last guy who swiped left on me aged so quickly he shriveled up into an old man skeleton thing before he turned into dust and died a swift yet horrifying death. I’m very important. I have many leather-bound books and my apartment smells of rich mahogany. What does your apartment smell like? You should know that I hate old people, children, and dogs. Actually, I love all those things but if you know what movie that line is from, we should go out. Tip: Feel free to not say much. 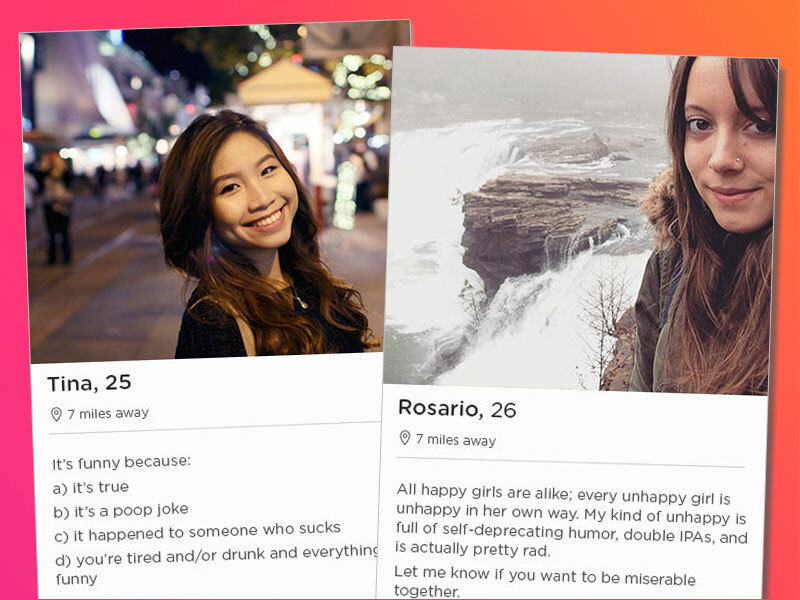 Because your Tinder bio goes along with your photos, don’t feel like you have to say a ton or write a novel to catch someone’s eye. In fact, it’s probably better that you don’t say too much. Keeping it short and sweet makes it more likely someone will read your bio in the first place (many people may move past you if they see a large block of text they’re not in the mood to read). Plus, it will keep them wanting more. Grew up in the Portland, Oregon area. Survived middle school by becoming a skater kid (still haven’t grown out of it). Now I’m trying to pay my rent, play my music, and make my way. Looking forward to going to Brazil in the fall. If you have any tips on what I should see, definitely let me know. I love guacamole, the original Star Wars movies, laughing with someone in the corner of a crowded room, when the sun shines through my blinds in the morning (just not before 9:00 please), and new people who tell horrible jokes. Oh, and I hate squirrels. Don’t let those little punks trick you. They’re just fluffier rats. Tip: It’s ok to be a little cheesy. Do you like sunsets? Are you spiritual? Are you confused about life and your place in it? Go ahead and say so. Chances are there are other people out there who can relate to your experiences, so don’t be afraid to get real or even a little cheesy. Not every dating profile needs to be clever or funny to catch attention. We’ve all seen product reviews but another quick trick to creating a different kind of profile is the fake review profile. What would your mom say about you? Your ex? Your neighbor? Your 2nd grade teacher? Your drill sergeant? 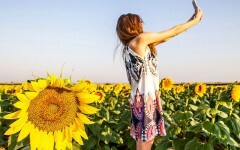 Writing silly, fake reviews for yourself can be a fast way to share more about yourself by going beyond the standard dating profile. Writing a profile may seem tough at first, but use a few of these tricks, see what works for you, and mix things up until you find a good fit. Or better yet, keep things fresh by switching things up now and then. Different profiles attract different people. And if you’re in the stage of dating where you’re open to meeting different kinds of people and aren’t sure what you want yet, this is an opportunity to see who’s out there.